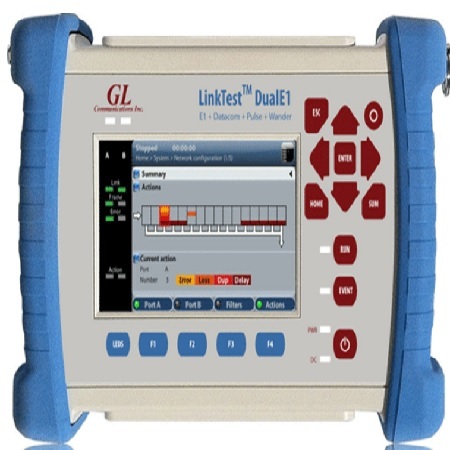 The GL's LinkTest™ Dual E1 is a handheld dual-port tester for E1 and data communications (V.11 / X.24, V.24/RS232, V.35, V.36/RS449, EIA-530, EIA-530A) interfaces. Port A is full featured 2048 kb/s interface. On the other hand, Port B usage is configurable (2048 kb/s TX/RX, co-directional, clock input). The LinkTest™ Dual E1 has an external DC input but it also has internal batteries. This makes this tester suitable for field testing applications. With the support of a large range of software options for E1 services and sub rate multiplexing system, this handheld unit provides a scalable test solution for E1 and data testing. It provides a large, clear screen with a full set of physical layer tests for E1 balanced and unbalanced circuits including BERT, VF, round trip delay and signal level.